If you have small children or a large family, you’re probably intimately acquainted with your washing machine. My washing machine is my best friend. It helps that it’s a LG Sapience Top Loader with Smart Inverter though. I mean, I don’t mean to humble brag, but my best friend is pretty amazing! 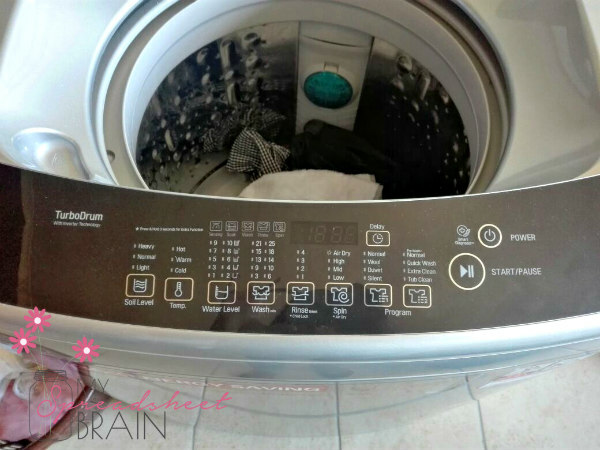 For starters, it has a bunch of really cool features that makes it so much MORE than just another washing machine. The Smart Inverter Technology eliminates wasted operation by efficiently controlling energy use. It also offers Smart Motion which offers 3 kinds of motions: ‘Agitating’ for powerful washing, ‘Rotating’ for tangle free washing and ‘Swing’ for a more delicate wash. The Turbo Drum™ enables the most powerful wash and removes even the toughest stains and the Punch+3 washing power creates powerful streams of water to help mix laundry up and down repeatedly for even washing result. The Auto Pre Wash came in so handy, allowing me to soak my super dirty clothing, before automatically kicking in to ‘agitating’ power wash. This can actually be put on a cycle (soak – wash – soak – wash) for stubborn stains. And all you need to do is press a button! 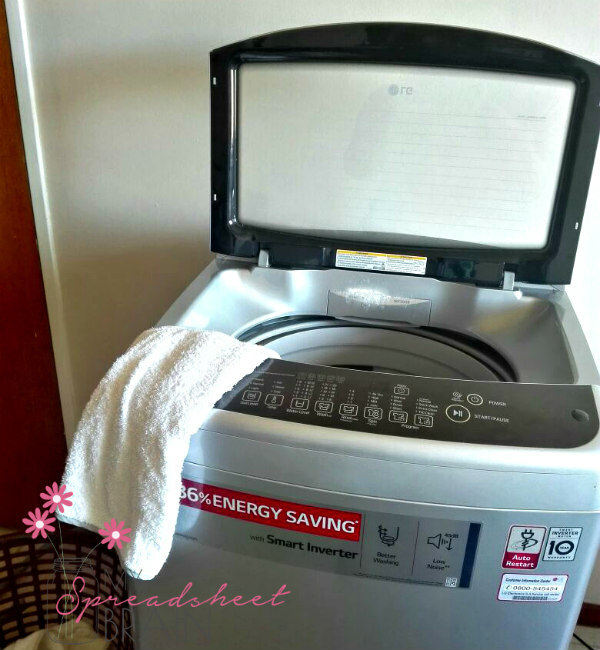 I must admit, I appreciated that the Smart Inverter Motor minimizes noise and vibration… especially when I’m doing washing at 11pm, after putting the kids to bed! 1. Make sure your machine is fully loaded, instead of washing small batches of laundry. If you only have a few items (hand wash?) adjust your settings to the smallest capacity. 2. Consider skipping the extra rinse option. Make sure you’re using the right amount of washing powder. 3. Wash more than one load of washing in the same water, by stopping the wash cycle before the rinse cycle starts. 4. Collect grey water in a bucket (or in your bath) and use it for the toilet, to water the garden etc. 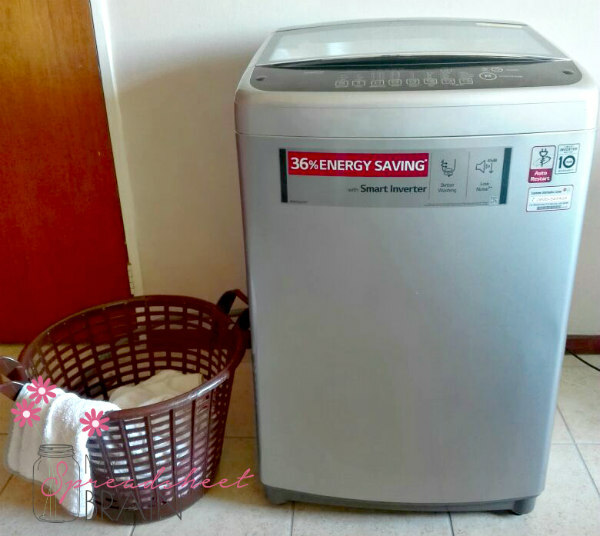 If you’d like to know more about my 15kg LG Sapience Top Loader with Smart Inverter, visit the website. Disclaimer: The LG Sapience Top Loader was sent to me but all content and images are my own.